"Dojo" means the "place" of the "way". In this case, the place where Aikido is taught. Most every night of the week, if your travels happen to take you through the back streets of Takasago (an excellent way to go if you are short-cutting your way from Tenjin to Hirao) you may pass a place where your ears are invaded by what sounds like bodies being thrown around. Upon closer inspection, your ears will hear an occasional "SLAP" ,and by edging just a little closer youll hear a cross between a primeval sounding grunt and a scream. The sounds you hear are no illusion. Inside bodies are being hurled through the air. But if you venture up the steps and peek in the doorway, the scene might surprise you. You would see happy smiling faces; people dressed in black and white on a green tatami floor in a swirl of motion. You would soon realize that the "slapping" sound is caused by the concussion of an open palm hitting the tatami floor. This seems to be employed by people who, having been launched into the air, now need a controlled method of slowing their momentum. And while the scene at once seems frantic and dangerous, there is an unmistakable aura of harmony about the place. As if, in all this commotion, nothing out of the ordinary was going on. You have entered an Aikido Dojo. This is the place where the "Way of Spiritual Harmony" is taught and diligently practiced. But what does this mean? Essentially Aikido is a Budo. We translate this into English as "Martial Art", but reading the kanji would paint a different picture. The kanji for Bu is composed of the character "to stop" and the character for "spear". Thus the meaning can be loosely translated as "to stop the spear". The kanji for Do comes from the Chinese word "tao" meaning "way" . But this does not simply mean the "way to do something" rather it has to do with the "way to lead a spiritual life". Thus one who studies Budo is not studying the art of fighting, but rather the way to become a better person. 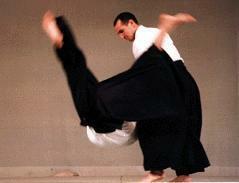 Aikido is a true Budo. This means that the study of Aikido is intended to make the practitioner into a more spiritually developed person, not into a bone-snapping crusader as pictured in the movies. But we are talking about a very physical and sweaty endeavor. In order to advance along the way one has to practice diligently. The basic foundation of this practice is the relationship between attacker and attacked. Thus daily practice is comprised mainly of throwing and being thrown. In Aikido, these two sides have names: "Nage" meaning the person who throws, and "Uke" meaning the person who receives or is thrown. Everyone, even the most rank beginner, practices both sides. And from that foundation of basic movements, a higher understanding of human interaction is attained. Aikido may be unlike anything you have ever done before, and yet it is so broad in scope that you can feel it touching every aspect of your life. Aikido is a purely defensive art. This means that there is no possible way to use Aikido to attack anyone. Thus in Aikido, there is an intrinsic morality: you are taught how to react to all manner of attacks, and the outcome, even though swift and precise, does no real damage to the attacker. Therefore, unlike some martial arts where an attack is first blocked and then neutralized by an appropriate counter, Aikido allows for a non-violent response: in essence a nullification of the aggression. The highest achievement of an Aikido master would be to control the aggression of an attacker to the extent that the attacker does not attack. The dojo in Takasago is led by the Shihan (Master Instructor) Morito SUGANUMA. Suganuma sensei came to Fukuoka in 1970. He was sent here by the Aikido World Headquarters which is located in Tokyo. When he came here he was only 27 years old, and yet he was expected to tame the wild people of Western Japan. Now 25 years later, Suganuma Sensei is the head of 30 dojos and 16 University clubs. So even if Takasago is a bit far for you to travel, you may be surprised to find out that one of the sister dojos is just around the corner from you. Suganuma Senseis teacher was the Founder of Aikido, Morihei UESHIBA, known to millions of Aikido practitioners throughout the world as "Osensei". 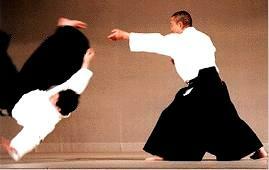 Osensei developed the modern style of Aikido after many long years of intensive training and meditation. Throughout his life, Osensei trained tens of thousands of students in the mysteries of "Aiki". Many of these students are now master instructors, and they are located in dojos throughout the world. 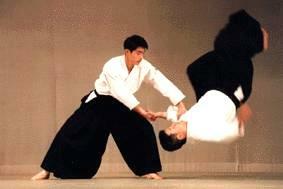 Aikido is truly a classical study of Japanese culture. In one art there lies the peace of the modern era blended with the violence of the past. And the culmination of the two is a moralistic path of self improvement and knowledge. In your exploration of what Fukuoka has to offer, try to make a stop at an Aikido dojo. You may be glad you did. The defender takes his stand on the mat. He is relaxed yet alert... An attacker rushes at him, but he remains calm until the last instant. There follows a split second of unexpected intimacy in which the two figures, attacker and attacked, seem to merge. The attacker is sucked into a whirlpool of motion, then flung through the air with little or no effort on the part of the defender, who ends the maneuver in the same relaxed posture, while the attacker takes a well-practiced roll on the mat. The movements in Aikido reflect the desire to merely neutralize an aggression, or render an attacker harmless, and the underlying goal is to not cause the attacker any serious injury. To do this requires a well refined skill, but more than that, it requires the ethical intention to cause no harm.